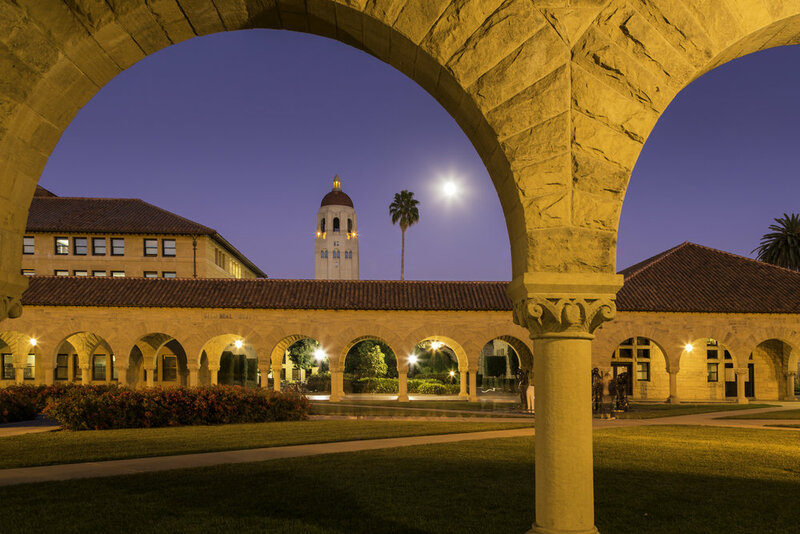 Just a few days ago I finished my last spring quarter exams and papers at Stanford, packed up my dorm room and headed home to Wyoming. Because Stanford is on the quarter system, school ends almost a month later than most other colleges which always makes me homesick because spring in Wyoming is one of my favorite times of the year. For those that don't know, home for me is the small town of Wilson, located just a few minutes from the southern edge of Grand Teton National Park and about an hour from Yellowstone National Park. After the long winter, June is when this area comes to life again. Grizzlies roam through the golden fields of wildflowers with cubs in tow, owls hunt in the forests, the pronghorn arrive from their migration, and the aspens explode with lush green leaves. Springtime is also generally before the craziness of tourist season begins, so the valley is comparatively quiet in anticipation of the summer season. My trip home this year is a short one because on Wednesday I head off to South Africa on a conservation photography trip . With just 5 days on the ground at home, I have been taking advantage of every moment I can to capture images of this spectacular time of year in the Tetons. That luck seems to have turned around this trip. 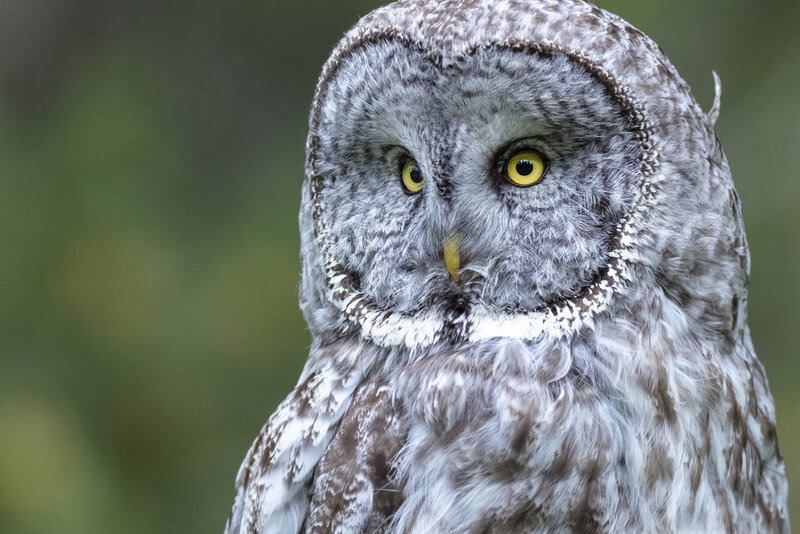 Within 5 hours of landing in the Tetons I took a hike into the forest with a friend in search of an owl and sure enough, had one of the greatest encounters of my life. I had hiked the area before, knowing that owls had been spotted there, but never seen one myself. After hiking around for over an hour, we were ready to give up, so we turned around to make sure we would make it to the car while there was still light. On the way back, my friend spotted the ghostly profile of a great grey just a few feet away. 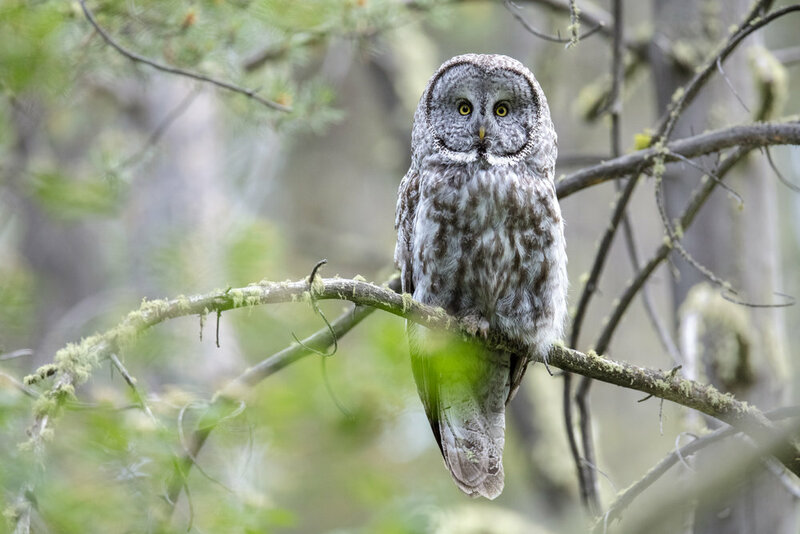 The beautiful pale great grey owl was perched on a low branch, calmly surveying the forest floor for its next meal. Most of the time, experiences with wildlife are fleeting, but the owl was relaxed despite our presence, making it possible to photograph and observe the owl for over an hour. After making almost hundreds of images, we decided to let the owl have its privacy for the rest of the night. I am always tremendously grateful for experiences like these where wildlife is calm and undisturbed by people. I believe this is how wildlife photography should always be. For me, it is about documenting wildlife in their natural state and using those images to help others who are distanced from nature to have a window into the natural world. If the magical encounter with the owl was not enough, I was driving through the nearby Absaroka mountains on the way home from visiting my sister at 3-Spear Ranch (check out their new website at this link! www.3spearranch.com) when I had another special sighting. Just as the last light was setting behind the distant range of the Tetons to the east, I spotted a dark shape near a willow-filled ravine. As we got closer my heart started to beat with excitement as I realized that the object was moving - it was a grizzly. The large silver-tipped female was just strolling along, eating the grasses as she slowly moved through the valley. Observing healthy grizzlies in the wild is a special experience that I never take for granted. I am always grateful for the generations before me that had the foresight to conserve and foster a future for these icons of the wild that were nearly extirpated from the lower 48. Encountering bears is a powerful experience and a tremendous conservation success that I hope Wyoming will prioritize to ensure future generations have the same opportunity. Wyoming recently legalized trophy hunting of these miraculous creatures, which alongside other human impacts, could result in nearly 1/7th of the entire Greater Yellowstone population being killed by humans each year. I cannot help but fear for the future of these creatures. 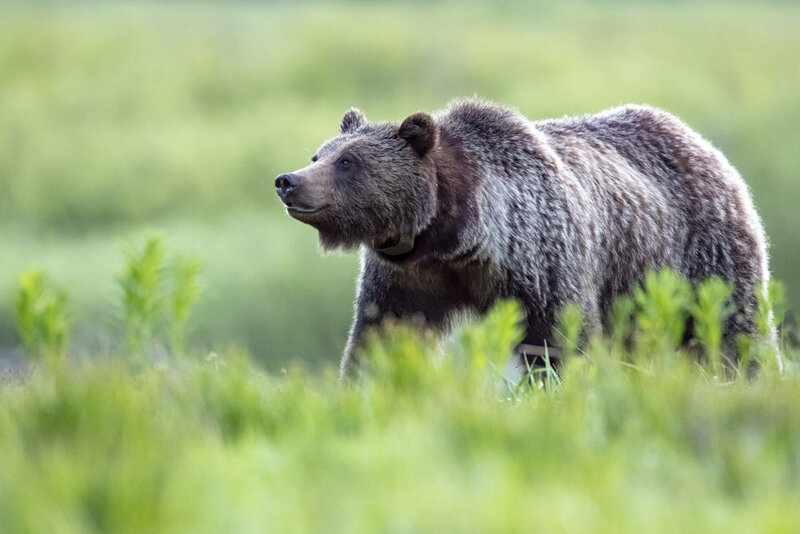 Though conservation has successfully brought grizzlies to their current recovered status, conservation is never something that can be considered complete. As humans, we have the unique responsibility to ensure the continued survival of earth's diverse web of life. Though humans may have the rare power to claim "control" over the planet, I believe that power can be directed towards conserving and coexisting with the natural world rather than asserting dominance. My brief time at home this spring is quickly coming to an end, but times like these always remind me how special it is to come back to Wyoming. Though there are countless other beautiful places around the world, none can ever compare to the amazing place that I am so lucky to call home. Keep posted for more stories and images from the field in South Africa over the next month! I will be traveling with Susan McConnell, Sebastian Kennerknecht and my fellow classmates from Stanford as we work on capturing and communicating stories of African conservation in and around South Africa's iconic Kruger National Park. Though wifi will be limited, keep on the lookout for posts along the way!